WordPress can look pretty intimidating at first glance. People often think WordPress is complicated simply because there are so many different customization options. From posts to pages and themes to menus, plus much more, WordPress can be pretty overwhelming if you are trying to take it all in at one time. Continue reading to find out the many reasons why users find WordPress so complicated and how to overcome those obstacles. Websites are many things to many people. Some folks use sites to start an online business. Others use them to change the world. But you’re here because you don’t want to be another netizen. You want to own your very own piece of internet real estate. That means sitting down, learning WordPress and maybe even spending some sleepless nights because you can’t get something to work. Folks who develop websites for a living often struggle to get something to work, and they have decades of experience. So if you’re a beginner looking to start your next website with WordPress, better get prepared because things can go pear-shaped from the get-go. The GOOD news is that because WordPress is so widely used (a quarter of all sites are built on WordPress!) there is a strong community who’s there working with the same platform. That means if you’re experiencing some problem, it’s very likely someone has already had that issue and has found the solution and posted it online for you to find! Or if you’re more of a hands-off website manager, then the other benefit to WordPress is that basically all web developers will be very familiar with it, so it wont be difficult to find help. What makes WordPress seem so complicated at the beginning is the sheer power and flexibility of the Content Management System (CMS). WordPress was designed to allow users to customize it in near limitless ways. It was also designed to support many types of websites. So when you first cross swords with WordPress, feeling a little intimated is normal. Don’t let that put you off though, because others have tamed WordPress. They now have complete control over one of the most robust Content Management systems in the world and enjoy every minute of it. WordPress powers some of the biggest sites in the World. BBC, TechCrunch, The New Yorker, and the Official Star Wars Blog all harness the power of WordPress. If you thought the Force was behind everything going on in Star Wars Blog, now you know better. You also know some of the things WordPress makes possible. They even used it to make a mockup of a missile guidance system for a popular TV show a few years back. While you can’t actually hurl missiles with your WordPress site, it’s jammed with tons of features to make your life as a webmaster easy and efficient. 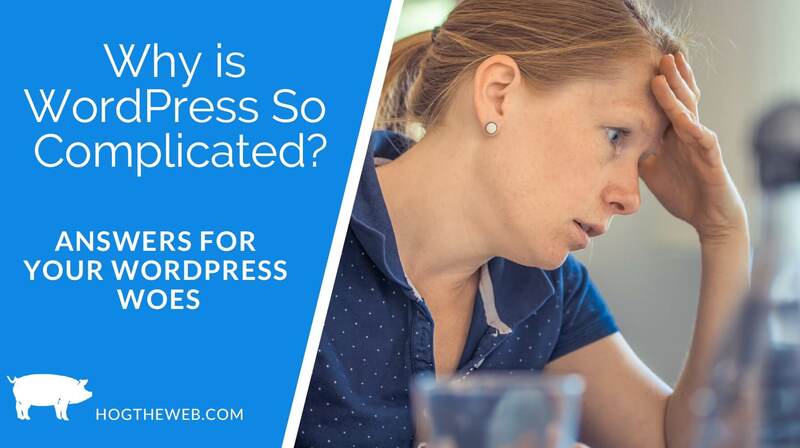 Let’s take a look at a few reasons why you should use WordPress, even when everyone is asking why is WordPress so complicated? WordPress goes back all the way to 2003 when there was no Gmail, Twitter, Dropbox or smartphones. WordPress quickly became a popular content management system (website builder) during those prehistoric days. Today over 74 million websites (or a third of the internet) use WordPress to post new content every minute. So, even with folks everywhere asking why WordPress is so difficult to use, it powers most of the internet. Downloading, installing, and using WordPress is completely free. You don’t have to pay a dime when you change it to suit your needs. With WordPress, everyone gets to create any kind of website they want. You’ll have to pay for a domain name and web hosting though should you want total control over your WP installation. There are free WordPress hosting options you can go with, such as WordPress.com, but you won’t be able to change your WordPress installation. You also get lousy tech support with free hosting. Most people starting out with WordPress go for free hosting. This inevitably leads to them asking why is WordPress so complicated? It’s the lack of reliable technical support. Signing up for a hosting plan gives you access to excellent tech support who are only too willing to help you solve any issue you might experience with the WordPress installation. That beats spending an entire day Googling for an answer only to realize you can’t do anything about your predicament because you don’t have complete control over your website. That brings us to a common question people starting out with WordPress ask. What is the difference between WordPress.com, and WordPress.org?The difference is, WordPress.ORG is the open-source software you can download and install on ANY web hosting server. WordPress.COM is a more limited version of WordPress which is hosted for free, more like WIX or Squarespace. MOST sites that use WordPress or discus WordPress and how powerful and flexible it is, are talking about the Open-Source WordPress.ORG version. Not WordPress.com. The fact that it’s open source is what makes it so flexible, because a developer can literally customize it to do anything they want. One of the best things about the WordPress CMS is the ease of customization once you learn the ropes. Lots of people teach themselves how to customize the WordPress dashboard, themes, and plugins without taking a course in web design or programming. While the learning curve is a bit steep, getting the hang of the WordPress headers, the loop function, sidebars, and footer takes less than a day. That’s everything you need to know to be able to customize a WordPress site. Most people find it easier to learn WordPress by reading the documentation of free WordPress themes. There are tons of free themes and plugins you can download, check under the hood, and see how WordPress works. However, before you just into using a Free WP Theme, if you’re going to rely on this website for actual business and not just a fun personal project, then you should consider going with a more robust, and stable paid theme. You can check out our list of the 25 most stable WordPress themes here. With popularity comes unwanted attention. WordPress hasn’t failed to impress on hackers looking to get their grimy, crooked fingers on the endless supply of personal data behind a WordPress installation. The community behind WordPress, numbering in the thousands, spend hours developing and testing every aspect of the CMS. The core WordPress development and research team pushes out frequent updates to plugin any holes in the CMS. They are able to stave off attacks before they become a problem to WordPress users. That doesn’t mean WordPress sites are impregnable fortresses. Sometimes users of the CMS fail to secure their installation. They use easy passwords, fail to update their sites to the latest WordPress version, and at times give out their WordPress credentials to nefarious characters. That’s why 40,000 WP installations get hacked daily. To keep your site secure, especially when starting out, always make sure you consult someone knowledgeable before making any changes. You can contact the support department of the hosting company signed up. Better yet, hire professional developers like Hog the Web to take care of the heavy lifting of website maintenance and security. There’s a new currency on the internet. If you want people to visit your website, and cash in, you need traffic. You can never have too much traffic.How do you get it? By making your website search engine friendly and mobile-friendly. If you’re using WordPress, you don’t have to worry about making your site accessible to smartphones and tablets. There are tons of responsive themes to do that, such as the Divi theme. The CMS also comes with handy SEO features and plugins, like Yoast SEO to make your work easier down the road. Can’t make something work on your WordPress installation to work? Googling WordPress plus the problem reveals thousands of guides and tutorials, all offering a solution. There are also tons of forums dedicated to WordPress offering solutions to all kinds of problems. You’ll have to put in a bit of effort though. Folks on WordPress forums, although pretty helpful, won’t coddle anyone. Just show you’ve done your research before asking the question. That being said, we’re happy to answer any WordPress related question you have. There’s no stupid question, so feel free to reach out to us today! If you take a bit to learn about the WordPress ecosystem, everything becomes easy. What used to take you hours or days to solve takes only a couple of minutes. That’s why so many people love the CMS. You have an automatic updater to keep your site secure. After installing a theme or a plugin, there’s no need to go back to the download page to check for updates. They update automatically too. Lastly, if you take time to learn the WordPress core structure, you can make WordPress do almost anything you want. Still Thinking of Going for WordPress Alternatives? WordPress is not the only CMS there. There are lots of other CMS suited for different needs. If you don’t want complete control over your website and access to advanced functionalities, WIX and Squarespace should serve the purpose. These two are website builders that allow you to get a website up and running in a couple of minutes by dragging and dropping elements on the screen. Both platforms are not mature enough to run complex membership or e-commerce sites though. If you pick up one of these options, all of that ‘ease of use’ comes at a monthly premium and lack of open-source customizability. You’re just a renter with access to the sitting room only. There you have it. A complete rundown of why WordPress appears complex, but it’s really not when you learn the ropes. WordPress is powerful enough to run your own social media site, and versatile enough to operate a full-fledged e-commerce site. If you’re not looking for all these advanced options and configurations, WordPress might not be the CMS for you. Most businesses, though, opt for WordPress because there’s no limit to the customization it supports, so their site can grow and expand as their business does. WordPress is also infinitely scalable, has a long history, a strong community, and best of all, it’s free. If you’re struggling to learn WordPress, we’re happy to answer any of your questions, and even do a screen-share conference to walk you through how to get the most out of your WordPress website. Get in touch with us today and open a new world of possibilities.